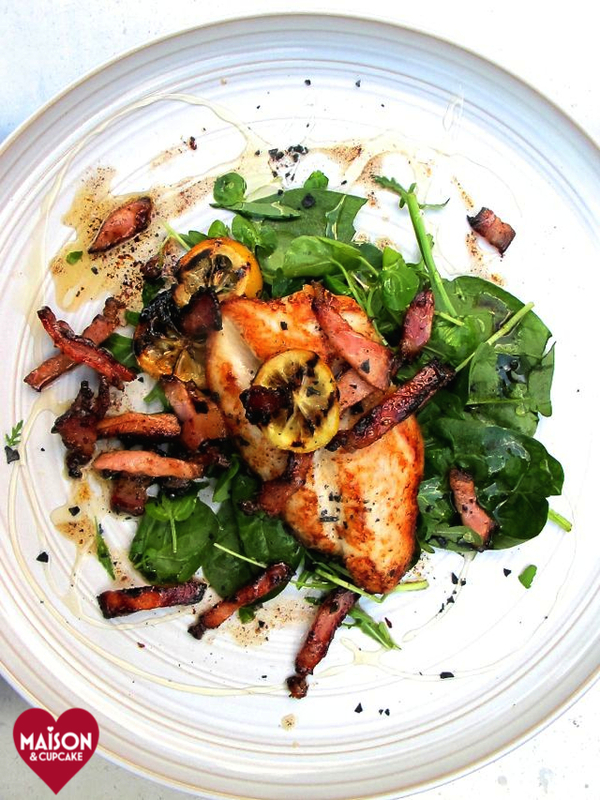 These basa fillets with bacon and spinach are a budget friendly dish to feed the family. Those sum-umm-er ni-iiiiiiiights. Tell me more. I love them. They mean I can photograph food at 9pm in the garden and get away with it. This bacon studded fish supper features in my latest post on BabyCentre “White fish dishes for every family budget” and slipped down nicely with a glass of budget bubbles on the patio last week. Basa, catfish and river cobbler are all things I’d thus far avoided not realising they were in fact all different names for the same thing. Finally I bought my basa spurred on by its low price and found it as satisfying to cook with as cod. I’m somewhat on the fence that it’s mostly imported from Vietnam so not exactly local but for curiosity if nothing else it was worth trying. They’re served with a squeeze of lemon, some black Falksalt (Cypriot salt flakes found in Westfield’s M&S) and a drizzle of honey. So no those black bits aren’t burnt bits, they’re my new hero ingredient. and Credit Crunch Munch run by Helen and Camilla, this month hosted by ME. If you’d like to enter Credit Crunch Munch pop your link in the linky below and I will round up after 29th July. This is the event for thifty dishes, imaginative thing with left overs, marked down ingredients made special etc – for a full list of criteria and rules check Helen’s post here. In brief, display the CCM badge and link to a) this post and b) Helen and Camilla’s Credit Crunch Munch pages. New meals only please and linky will close on 29th July. « Our Kids Pizza Express party made the best birthday ever! That looks delicious! A wonderful dish. That looks so appealing and bright. Lovely! Who would guess it was a budget meal – it looks very restaurant worthy. That looks amazing Sarah! Beautiful photo too. I love these summer nights, makes food photography so much easier! Plus I adore fish so this would suit me perfectly. A delicious recipe Sarah, there is nothing to beat fish and bubbles! Beautiful dish and photo Sarah. I’ve never tasted basa – intrigued. It was pretty good. I would like to know though how ethical it is to import farmed fish long haul rather than fish cod closer to home. Fish farming is rarely sustainable or without a detrimental impact on the environment. 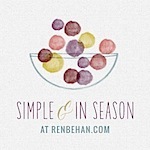 Anyway, thanks for entering Simple and in Season – round up finally posted. I’ve always steered clear of basa or river cobbler. I think the ‘river’ bit has always given me visions of a rather muddy tasting fish. Perhaps I should be less judgemental! I am def a fan of long summer nights too for food photography. Not sure I have ever eaten basa though so one to watch out for. Beautiful dish – great photography!